If you are having a Christmas or winter themed wedding them why not make a dashing entrance and/or exit? You may be traveling from the wedding site to the reception or simply leaving to the wedding site, but why not do it with pizzazz. 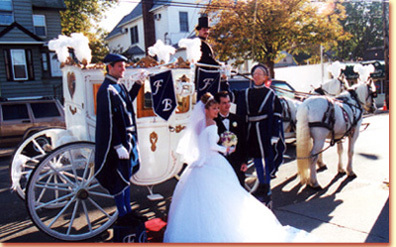 Invoke the spirit of the Christmas season and travel by horse drawn carriage. The harness can be decorated with Christmas foliage and lots of chiming bells or left as is. Either way it is a romantic and unforgettable way to travel!